The latest KPMG and REC, UK Report on Jobs showed that heightened uncertainty towards the outlook underpinned the fastest decline in permanent staff appointments since mid-2016 in March. Brexit-related uncertainty also contributed to a further steep decline in staff availability. The latest Skills Shortage Bulletin from The Edge Foundation. Links is now available. In this edition, we look at the current state of the labour market through research by CIPD. This suggests that, with so many graduates in non- graduate jobs and workers not making full use of their skills, as many as half (49%) of UK workers could be in the wrong job, based on their skill level. Please see a request below from Ageing Better regarding a consultation they are undertaking into improving recruitment outcomes for older job candidates. Ageing Better are about to begin a programme of work looking at improving recruitment outcomes for older job candidates. As part of this we are conducting a month-long consultation process to ensure that we have as good an understanding of the topic as possible before designing and commissioning said programme of work. I thought that you would be able to offer some useful insight on this topic, and would very much appreciate if you could answer some of our consultation questions (see below) or suggest a colleague who might be able to respond. Further details can be found in this document, but the questions. 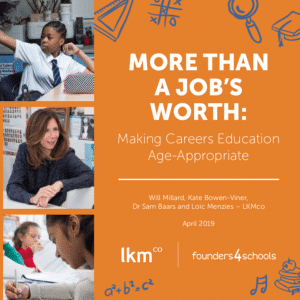 Report from LKMco: Careers Education: What Should Young People Learn and When? More Than A Job’s Worth: Making Careers Education Age-Appropriate was commissioned by the charity Founders4Schools, and argues that children’s careers education should begin as soon as they start school. While this is something that may make some people squeamish, the report sets out how this can be done in an age-appropriate way. For example, the research highlights how some nurseries and primaries launching careers education early have added ‘jobs corners’ to their classrooms, where costumes, props and stories about different professions are available for pupils to explore. In a newly published article in the ANNALS of Political Science from the CUPESSE project, the effect of unemployment and quality of work on work values is explored. The effects were unexpected; unemployment experience did not have an effect on work values, but overqualification and precarious contracts had opposite effects to each other. Changes to the modern labour market have affected the way people experience work. We see increased flexibility, higher education levels, overqualification, high unemployment and the rise of precarious work. These developments have had the greatest effect on young people who are new to the labour market. Youth unemployment affects can have long term scarring effects for the individual and carries a significant economic cost to society. have of what their MBAs will help them achieve. The proportion of women enrolling onto Association of MBAs (AMBA)-accredited MBA programmes globally over the past five years has risen, according to new research from AMBA. The latest MBA Application and Enrolment Report found that less than a third (32%) of enrolees in 2013 were women, compared to 36% in 2017. New data by AdView’s based on an analysed of 13 different metrics, such as wage growth, average monthly rent and employment rate, shows which cities and regions in the UK rank the best in terms of opportunity and affordability for graduates. The financial crisis also in some cases obstructed 2008 graduates’ entry into their desired field, with half (50%) saying they had to change their post-university plans and three-fifths (62%) taking a job in a different sector because of lack of available roles. End-point assessment is new for everyone. Most of those involved in trailblazer groups and end-point assessment delivery would agree that assessment plan design has improved as we’ve gone along. New analysis from The Open University (6 Feb) suggests that UK businesses could be at risk of losing £3 billion in funding that could be used to increase skills and boost productivity. Organisations have only drawn down 14 per cent of available funding from the apprenticeship levy – and from April the government will start to anything left over month by month, so The Open University is encouraging businesses to act now before they miss out on an opportunity to build skills they desperately need. The data, secured by The Open University through a Freedom of Information Act request1, reveals that employers have earned back just £480 million of the total funding available since May 2017. So far, only one in five (19%) levy-paying employers have made apprenticeship commitments, with many reporting some kind of frustration with the scheme.